September was a bit of an odd month since we were partially work kamping and partially traveling back east. Our travel costs were high since we were making the trip in a compressed time frame and although we received some pay in September our last checks were actually paper copies and had to be mailed us. Not sure why they do this and thankfully they allowed a one time mailing address for that check so we had those mailed to Lee’s parents. Consequently that $1708 is NOT included in this budget because the cash is not in the bank. Even without this money though we broke even for the month with $49.50 to the good, which was nice. We also have a profit sharing check that will be coming at the end of the year and that should be an extra few hundred dollars each, but that doesn’t come until December. Details are listed below. Campground Fees – We spent $89 camping as we started traveling. That wasn’t too bad and the two days boondocking with Cori and Greg helped. Groceries – We went over by $200 because we stocked up both at Winco and Costco. I also think it was because we kept spending like I had recycling money coming in but that dropped off sharply in September. Another factor was I tried about 20 new recipes for my recipe book in those last couple of weeks and every time I try to do that in a compressed time frame, my budget always spikes. Dining Out – We did really good in this category especially we tend to over spend when we travel. $38 to the good. Entertainment – This was our saving grace as we only spent $25 in this category. That’s a good thing since next month I am sure will be crazy. Internet – Not quite sure why we went over $74 in this category. I really need to look into this. When I get a few minutes. With our schedule that may be a while. Cigarettes – Since we were going to be traveling, Lee went ahead and stocked us up. We get lots of questions about this category so for the record we buy online and buy in bulk, so our costs are using quarterly in this category. The budget amount is last years annual divided by twelve. So we did OK, but once again just breaking even does cause a downstream problem. We know our costs will be higher while we are traveling so then you are dipping into savings to cover those costs until the next gig. It’s hard on what we make to make that money back, so you’re always sort of vaguely in arrears even when in a particular work month you are ahead. That’s why I think most people we have met who are longtime working RVers develop the same jobs and a route. It is much easier to budget when you know how long your breaks will be and you can budget those breaks in and try to keep travel costs down. We are still working it out, and will definitely have more info at the end of this year, but it’s pretty clear (at least to me) why folks who work limit their travel. 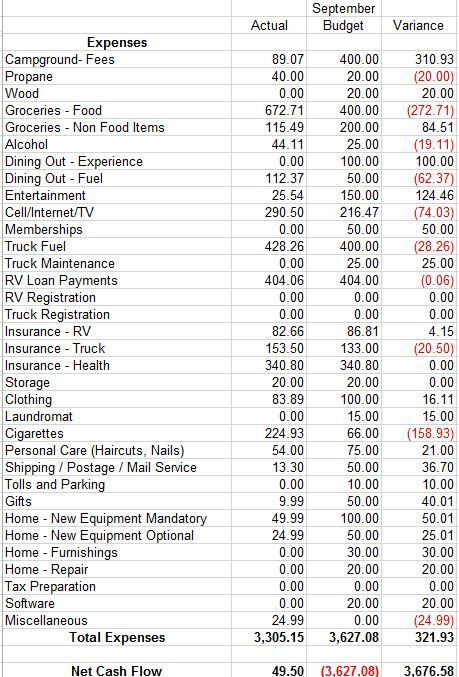 This entry was posted in Lakeside and tagged Full Time Budget, Full time Rving Budget. Bookmark the permalink. Hi Tracey, a while back you provided me with information regarding your healthcare plan. I have misplaced the email, I hope you could provide it to me again. Carole & I are living in the MH after selling our house, we will hit the road at the beginning of Dec. 2017. We will head to FL for Jan. 1st for four months, during that time we will become Florida residents. Health care information from FL would be very helpful. We signed up for the Affordable Care Act which was a little cumbersome but once we were on it it has been ok. We have a high deductible PPO and it is important to get a PPO versus an HMO because I can see any physical I want while traveling. I have an HSA account with money it to cover the deductible and thankfully minimal healthcare issue so that works for us. Open enrollment starts in November and I would definitely start the process early as it takes awhile. If you have serious health issues you definitely should think through how to keep existing doctors while on the road, even if that means keeping your home state the same. I really miss my doctor of 15 years but knew I would rarely be able to get back to New Hampshire even if I could find a way to maintain New Hampshire residency. Choosing a state is a big decision and definitely health care is a big part of that. I wish you all the best.